Leaders in student affairs have embraced new notions of leadership as collaborative, non-hierarchical, collective and focused on social justice and change. Well not everyone, but certainly I find leaders in student affairs strongly align with new ideas about leadership embodied in models such as Helen Astin’s social change model of leadership or Allen and Cherrey’s systemic leadership. And, not surprisingly, it is research on effective women leaders that was used to create new conceptions of leadership. Unfortunately, as women are entering positions of authority on college campuses, the environment is changing markedly and is becoming much more corporate and market-driven in orientation. The pressure to compete comes from the global economy in which a more capitalist orientation is seen as preferable and essential for success in the coming decades. An example of this more market-driven culture on campuses is the need for leaders to focus on entrepreneurial activities in order to maximize profits from research ventures through patents and licensing by creating partnerships with industry. Campuses are increasingly focusing on pursuing profits through technology transfer and lucrative partnerships and are deemphasizing the liberal arts and public service once important for the common or public good. Within this corporate approach, leaders are encouraged to centralize power; develop top-down authority structures; cut costs; use corporate management practices such as outsourcing, benchmarking and metrics, marketing and public relations; and exercise business oriented forms of accountability focused on the bottom line. Therefore, if we examine the pressures that women will experience to lead in top-down, hierarchical ways focused on the bottom line, it seems important to think about ways women can lead that blend the important approaches that they have fostered (such as collaboration and ethics that help campuses be effective) with an understanding of ways to navigate and work within the increasingly hierarchical, market driven leadership environment. One leadership model that attempts to blend the best of women’s leadership approaches with traditional approaches to leadership is the connective leadership model developed by Jean Lipman-Blumen (1996). 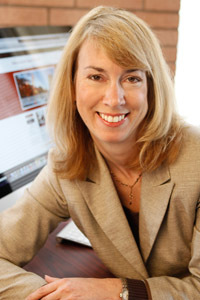 Lipman-Blumen argued that leadership needed to embrace a more complex and multi-faceted approach in the 21st century, which she labeled as connective. Connective leadership is focused on three main: relational (collaborative, contributory, the vicarious/mentoring); direct (powered, competitive, intrinsic); and instrumental (empowers, networking, and persuasion). Within the relational facet, the leader use collaboration and a contributory style by helping others to learn and succeed. Vicarious is encouraging and guiding others often through mentoring. Within the direct area, intrinsic means relying on oneself to complete work. Competition is being driven by external standards of excellence and seeing each activity as a contest or forum for achievement. Power relates to using power wisely to get things done. Under the instrumental facet, personal means being charismatic and being able to motivate. The social style means harnessing networks and partnerships to get things done, and entrusters build strong relationships that can be utilize for support. Connective leaders can be anyone, not just those in positions of authority and can involve groups, not just individuals. A leader might recognize that he or she is not good at being instrumental but bring in other leaders to help contribute this skillset. Connective leadership does not necessarily suggest operating in traditional ways (using a directive style for example), but instead recognizing various styles exist and knowing how to communicate with leaders using different styles. This knowledge and skill will help women address the politics and unanticipated reactions that lead to their failure to identify and appreciate market and corporate approaches in earlier studies noted above. As Lipman-Blumen (1996) predicted, we are living in an era when leadership requires a complex integration of many different approaches to leading, but emphasizes the best qualities out of these varying leadership approaches that have developed historically. For women who fought so hard to have new views of leadership embraced, blending in these other styles can feel threating, problematic, or like selling out. Yet, I believe the future is best served by a leadership approach that embraces women’s perspective but combines it with the best of other approaches that have emerged and that aligns with current pressures in our environment. Women seeking out differing leadership perspectives and showing the ability to navigate among various approaches will be pivotal to the success of higher education in the future. Please use the comment space to tell us: What will it take for you to be a connective leader? Adrianna Kezar, Professor of Higher Education, University of Southern California. Dr. Kezar has several years administrative experience in higher education as well both in academic and student affairs and she is a national expert of change and leadership in higher education. Her research agenda explores the change process in higher education institutions and the role of leadership in creating change. Kezar is well published with 14 books, over 75 journal articles, and over a hundred book chapters and reports. Her recent leadership book is: Enhancing Campus Capacity for Leadership (Stanford Press, 2011). Citation: Lipman-Blumen, J. (1996). Connective leadership. New York: Oxford Press.